Company Overview - Shandong Hongqi Machinery & Electric Group Co., Ltd.
5YRSShandong Hongqi Machinery & Electric Group Co., Ltd.
Shandong Hongqi Machinery & Electric Group Co.,Ltd is a big scale enterprise conmbined military and civilian.The company is located in Binhai Economic Developement Zone, Weifang city ,Shandong Province.The company covers an area about 1000 acres and has more than 600 employees at present . The total amount of fixed assets is 150 million RMB.It owns the advanced and perfect means of machine manufacturing and well-found means of calculated and technical organization,and it is a second class physics and chemistry unit. 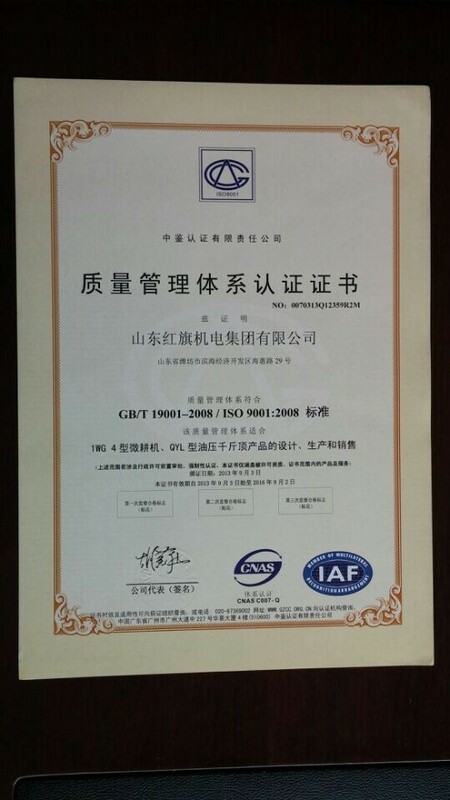 The company has passed the authentication of the GB/T 19001-2008 Management System of Civilian Quality .The company has strong R&D capabilites of the military and civilian goods. Its product research and development center is the municipal reseacrh and development center of Weifang City We product Mini-Tiller ,Hiller,Mover,Rice Transplanter,Sludge Dewatering Machine...act. With super quality and competitive price,we willing to cooperate sincerely with Chinese and foreign friends from all walks of life and seek common developments.